Sarah Cooks: Venice & Rome: GELATO! 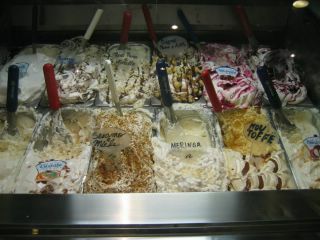 Here are my photos of most of the gelati I ate whilst in Italy (Venice & Rome). I have a love-love relationship with gelato, which began when I was a child, being treated to gelati on Lygon street by my Dad on weekends, and severely escalated 2 years ago when I made my first trip to Europe, during which I spent 2 weeks in Italy. In prepration for my first visit to the land of Gelato, I took Italian lessons, dutifully studied my Lonely Planet and Vogue Entertaining and Travel guides for the best gelaterie. When I arrived, ate all the gelati I could - checking out all the recommendations from the guidebooks, and stopping in at any decent looking one I came across. 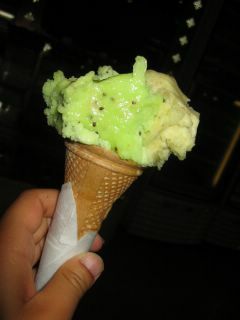 This ended up being about 3-5 gelati per day. It was awesome. 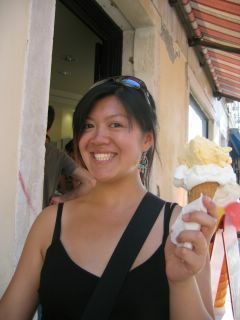 On this trip, however, I only had 5 days in Italy, but Clarice and I certainly did our best. "Omg, Enough with the freakin' photos!" 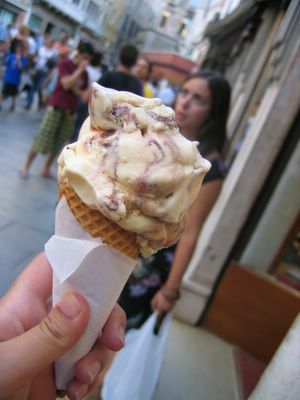 This one, again in Venice, is Ferrero Rocher flavour, I think. 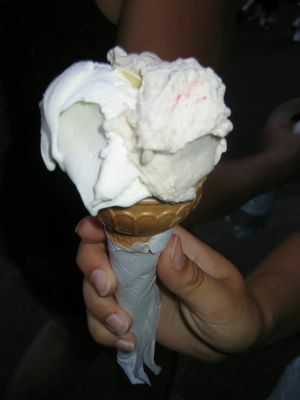 Gelato! Banana and Fior Di Latte (double cream). 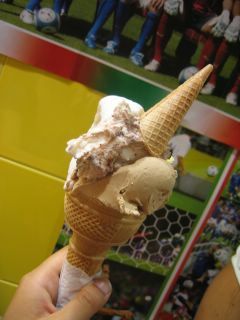 The best gelato flavour combination ever! 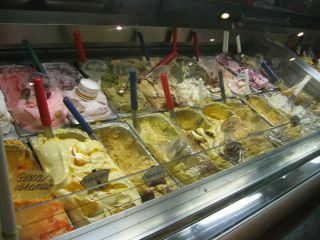 This is from some random gelateria in Rome. 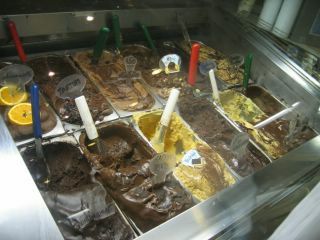 I read about this gelateria in the Lonely Planet. I think the photos speak for themselves, but this is the hugest, craziest, most awesomest gelateria ever! Repeat visits are a must. This one's a chain store, but don't let that put you off. I was recommended this place very enthusiastically by an American girl who I met in Paris on my first trip to Europe. Her recommendation went something like this. 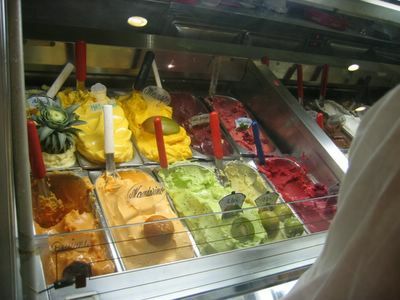 You like gelato? 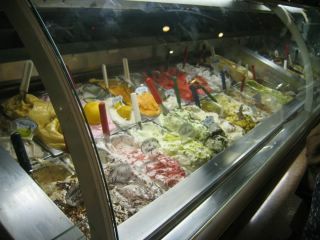 Oh my god, you have to try this place in Rome, it's so amazing. 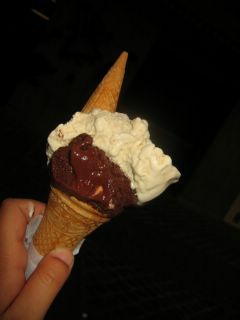 Their chocolate flavour is just incredible, it's so dark and rich... and they give you the BIGGEST scoops! When you're at the Trevi Fountain, stand in front of it, facing away, and just go down the street on your right for like less than a block, and the shop is called Blue Ice... Oh my god, their chocolate is so amazing! OMG, I'm DYING it all looks so good!! But no Baci!? Eh, must go back! Nutella! 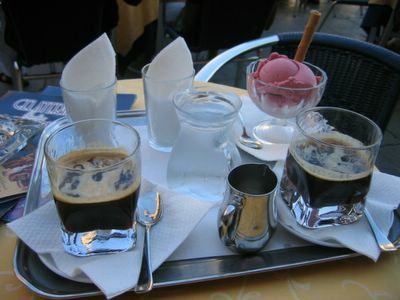 Baci! Pistachio! Fragola! ACE! 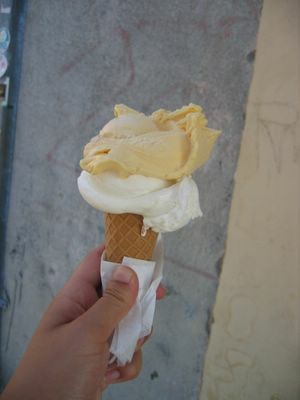 Did you go to Giolitti's (near the Pantheon) and San Crispino (near Trevi Fountain)?? We stumbled onto Giolitti's when we followed a trail of gelato-eating nuns. 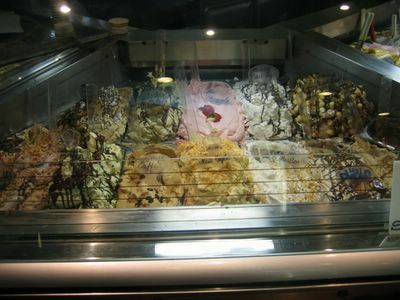 Turns out it was just around the corner from our apartment...like less than a 100 m.
Hmm... Giolitti's sounds familiar - I can't remember it exactly, but in my 5 gelati per day, I'm sure I would have stumbled in. Gelato-eating nuns!! Wow! I guess it's always a good idea to follow locals and see where they eat.